Tobe or not Tobe? That is the question – and that is also a gag that only works if you pronounce it correctly. While Bill Shakespeare’s bones are groaning for a thousandth time, Mr Tobe ‘call me Toby’ Hooper, the director, producer and co-writer of The Texas Chain Saw Massacre, is facing the cameras of the press at this year’s FrightFest, Film4’s annual five-day festival of horror cinema, and word gets around that he’ll only be signing autographs for 15 or 20 minutes. 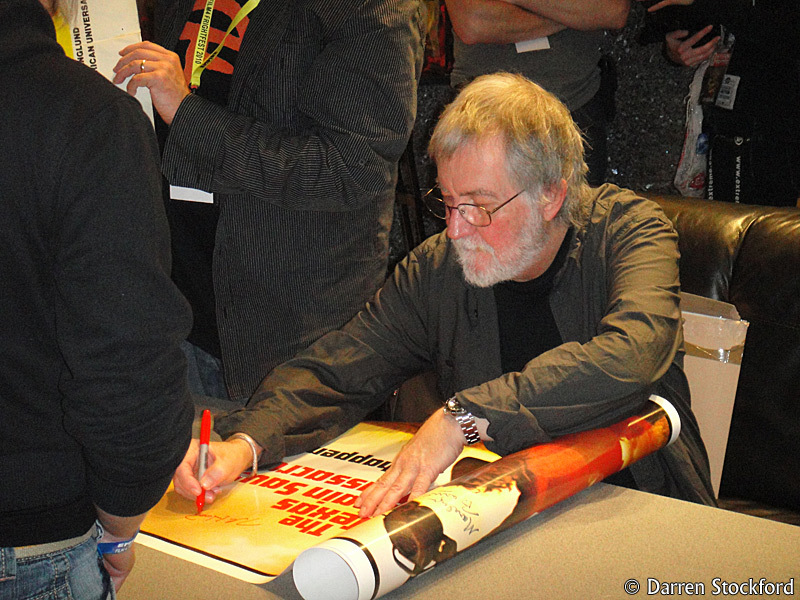 The queue to meet him, of which I’m part, snakes around barriers in the foyer and back up into the cinema auditorium, where those near the back are considering the notion that the posters, prints and DVD sleeves they’re clutching might not actually get to connect with the tip of Hooper’s Sharpie. It’s Friday afternoon at the Empire in London’s Leicester Square. A few days ago, the billboard out front declared that the venue was home to Harry Potter And The Half-Blood Prince, but now… well, it’s all gone a bit X-certificate. A Nazi demon prowls the crowded foyer looking for victims, while the gathered clientele are dressed to kill, a variety of horror-themed T-shirts literally rubbing shoulders as they wait for the theatre doors to open. The occasion is Film4’s FrightFest, which has taken over the Empire 1, the capital’s biggest non-IMAX cinema screen, for its annual five-day festival of blood and terror. Today sees the world premiere of the remastered An American Werewolf In London, ahead of its 28 September release on Blu-ray. The film’s writer and director, John Landis, is here to introduce it and, afterwards, field questions from the assembled throng. Okay, where the heck is everybody? It’s Bank Holiday Monday, 9.20am: day five of FrightFest, London’s annual horror-movie festival. An undead apocalypse is supposed to kick off in Leicester Square in 40 minutes, but the only sign of its arrival is a couple of rather brave zombies in medical garb, sitting in the corner on a bench. Kudos to the doctor and his lovely assistant, but there’s no way I’m going to ‘zombie up’ in public unless more people show up. 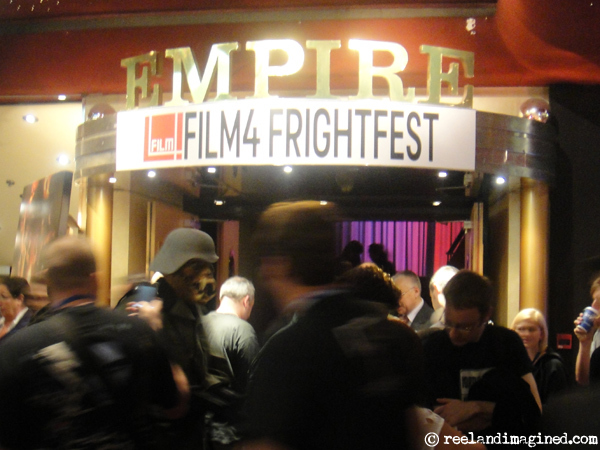 Two years ago, FrightFest organised a gathering that attracted nearly 700 walking corpses. Leicester Square was awash with blood and entrails. Naturally, I donned some make-up and a ‘bloodied’ shirt and got stuck in. It was a glorious morning: a celebration of zombiedom in all its forms. You couldn’t move for the undead; there was literally nowhere to run. A sound system pumped out Fabio Frizzi and Goblin, while TV crews captured the hungry, and very vocal, hordes on videotape for the six o’clock bulletins. 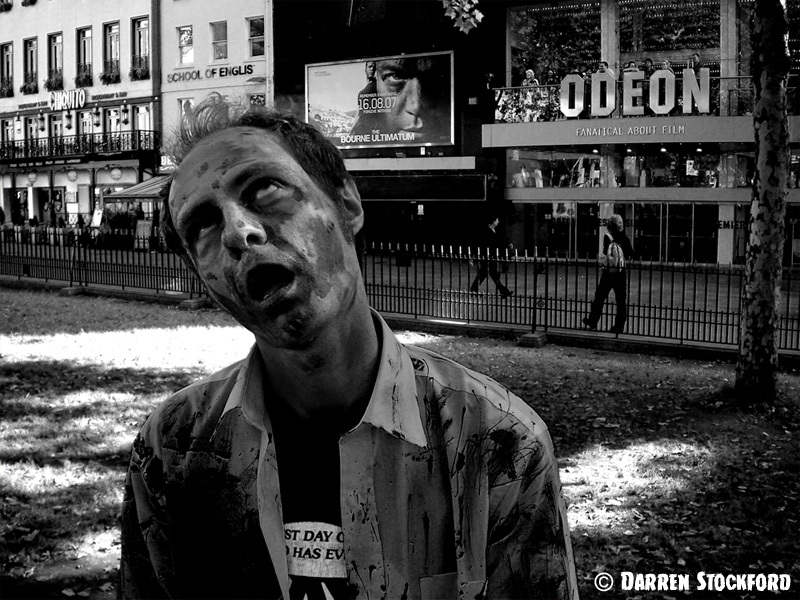 This morning, despite it being a bank holiday, I leapt out of bed at 7am and dashed up to London’s Leicester Square to take part in a world record attempt: the biggest ever zombie gathering. The record’s currently held by the undead of – where else? 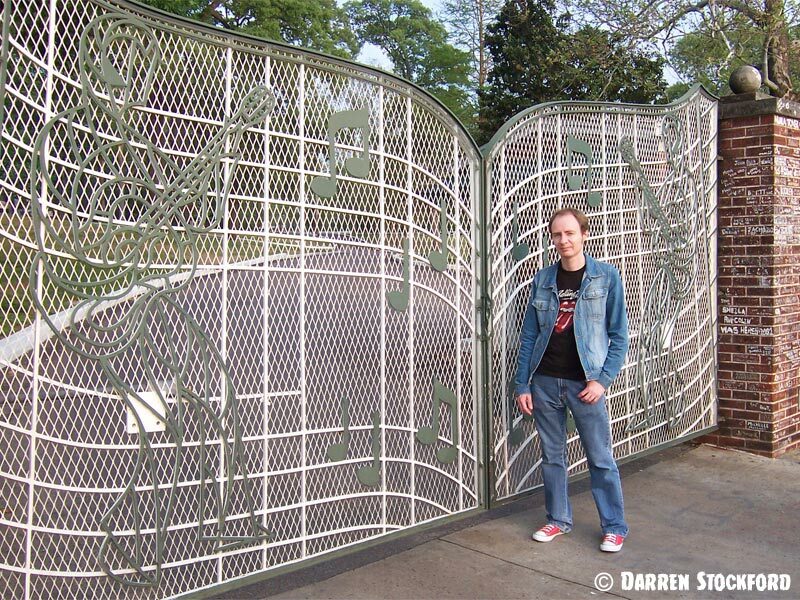 – Pittsburgh, where on 29 October last year 894 zombies wailed their way around Monroeville Mall, a venue that needs no introduction to fans of the original Dawn Of The Dead. 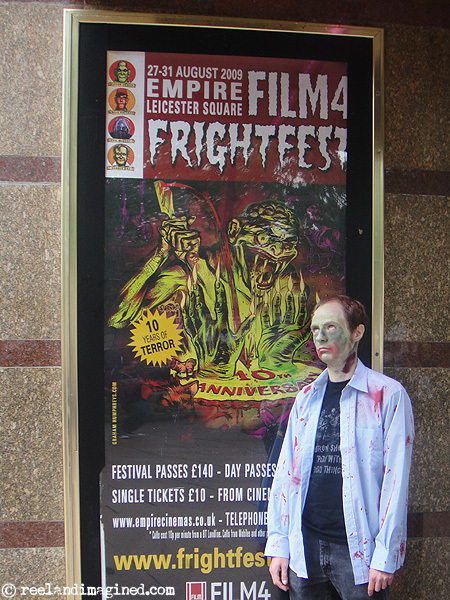 The London event was organised by Frightfest and tied in to the promotion of new British indie movie The Zombie Diaries, which had its UK big-screen premiere at the Odeon straight afterwards. But more about that in a mo’.